The Keystone Giant Bell Pepper is an extremely large bell pepper variety that was developed from California Wonder, for not only its huge size, but also to be resistant to mosaic virus. This lovely giant has now been grown for a good many years and is widely adaptable to an assortment of climates. This great pepper variety produces a large number of large, four inch by four and three quarter inch bell peppers with very thick walls. 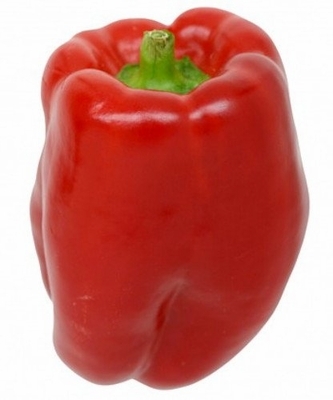 When immature, the Keystone Giant Bell Pepper is a lovely jade green and then ripens to a brilliant scarlet red. Due to its huge size and thick walls, this bell pepper variety is ideal for creating stuffed bell peppers. Due to its heavy foliage and large stems, the Keystone Giant Bell Pepper is also resistant to sun scald and is a great bell pepper for commercial shipping or market use.